The theme for the October box is Boxy Bazaar. This is a weightless heat protecting cream that is fortified with rosehip, argan, and coconut oils. It is supposed to protect your hair from heat upto 450 degree and tame frizz and enhance shine and softness. I only used this once and my first impression is that it didn't lessen my frizz or give me any shine which is too bad. I'll try it a few more times before I really write it off. Boxycharm collaborated with Luxie Beauty to create this 3 pack of brushes. These brushes are cruelty free and I've never heard this before, but they and have an antibacterial coating that keep the them clean and fresh. Interesting! I'm super excited to have received these 3 blending brushes! We've received Luxie brushes in our Boxycharms before and I've always really liked them. I've never used any Temptu products or their airbrush system so I was interested to see what this is like. This liquid bronzer is oil-free, non-comedogenic and hypoallergenic. This is supposed to be a smooth, long-wear, and velvety matte liquid lipstick. I received the shade Piquant which is a beautiful brownish purple. I've worn this liquid lipstick a few times and once it dries it is matte and almost kiss-proof. I does come off with eating or drinking. I've never heard of this brand but this is a gorgeous trio of neutral shadows! They are super pigmented and easy to blend. I've used this palette a few times and I truly love it! I wear the gold shade all over my lid, the cream shade in my inner corners and the brown shade in my crease. 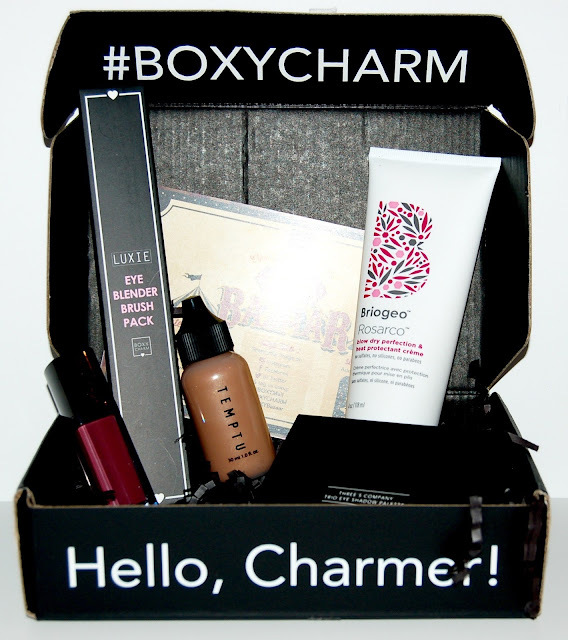 Overall I thought this month's Boxycharm box was great! I'm really excited about the eye shadow trio and the liquid lipstick. And I love that we received 3 blending brushes! Each Boxycharm box costs $21, you can cancel at any time and shipping is free. The retail value of the items in this box comes to $128, that's 6 times the cost of the box!